Include only one extension in each anwer. Include a description of the extension, its pros/cons, and why you use it. Link to the developer's website, rather than a direct download page. Please do not give a price because that can localize your answer too much. Sets up Chrome to default to blocking Flash content on webpages. Helps reduce download time and bandwidth usage since flash files aren't loaded by default. Easy to adjust blocking filter to allow flash for entire sites via a button in the address bar. Sometimes removes stuff without an easy way to add it back with the extension running. Does a good job of preventing ads from showing up. Inspired by the Firefox Extension AdBlock Plus. Helps reduce the time it takes for pages to render and bandwidth usage since ads don't have to download. Some sites and/or features don't work with ads blocked. 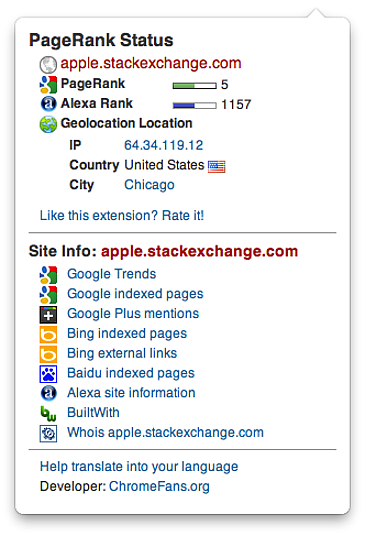 Your StackExchange notification inbox, right into your browser's toolbar. This extension will automatically convert prices (Dollars, Pounds, Yen and Euros) within the page to the selected currency. If any conversions take place, an icon will appear on the address bar. Hovering on it will show the sum of conversions.Clicking it will restore (and convert back) the affected prices. This extension provides quick and easy access to DNSSD advertised websites from within Google Chrome and Mozilla Firefox. AKA it's an awesome plugin that shows you all Bonjour sites/services available on your network! Think Safari's Bonjour collection but awesomer, geekier and in a decent browser. Free little extension that allows you to view and edit cookies. A tool to help you identify and fix performance problems in your web applications. Turns long, multi-paged articles into one page. Great extension! Add missing functionality to Chrome. An extension that allows you to +1 any page from Google Chrome. Not the answer you're looking for? Browse other questions tagged software-recommendation google-chrome chrome-extensions . Which OnyX setting resets my Chrome extensions?